The story of Taos Land & Film is almost exclusively the story of Jeff Jackson, an independent filmmaker determined to remain creatively independent through sales of real estate in Taos County New Mexico. 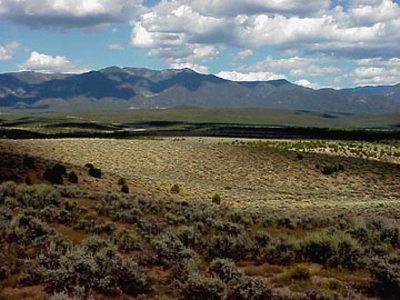 Since 1989, Jeff has developed over 5,000 acres of land in Taos, mostly along the edge of the protected wild and scenic Rio Grande Gorge, a dramatic 700 foot+ rift valley tearing through the north central part of the state. Sales of Taos land over the years have helped to realize Jeff's award-winning documentary film Death and Taxes, his HBO premiere Postal Worker, and fund local film festival awards. Combining his love for film, Taos, and ingenuity in marketing, Jeff gave the Taos Talking Picture Festival its trademark feature, an annual Innovation Award in the form of 5 acres of beautiful Taos mountain land, complete with clear title. Often drawing other film-makers and artists from around the country, many of Jeff's real estate clients, including the winners of the Innovation Award, have also become his friends over the years. Today, there are still creative communities growing in the areas Jeff is developing, who share a mutual love for the arts and the spectacular Taos landscape. Not one to sit idle on his achievements, Jeff sees profound new promise for democratic fundraising platforms like KickStarter and Indie Gogo to advance creativity and important social causes, and is reviving the extremely popular 5 acre land giveaway toward promoting and funding his current film project, "Ghost Phone: Phone Calls from the Dead". Jeff first introduced the 5 acre Taos land prize as the Innovation Award at the Taos Talking Picture Festival which ran annually from 1994 to 2003. The popular land giveaway has returned as a KickStarter fundraiser incentive for his current project, Ghost Phone, movie and phone app..